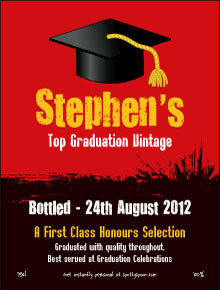 Wise Owl Graduation Wine Label. A Top of the class design for the highest grades in examinations. Want to give a gift for a graduation? Our wise owl label design creates a fun personalized wine bottle to mark the ceremony. Whether first class honours or a mere third, you can help them celebrate with a bottle of their wine to celebrate passing examinations after years at college or university. Perfect for clever, hard working, studious, book lovers and lazy, bored or would-rather-be-at-the-bar students alike, this is a fun idea. Note - good phrases to use include 'Award Winning', 'Made with real intelligence', 'a leader in its field', 'top of its class', 'the choice of academics' etc. Love spotty spoon labels. I have used them a few times now and the recipients always ask where I get them so I hope you get more business!